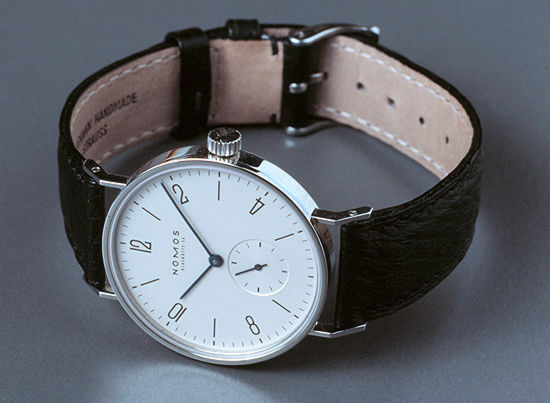 I had not heard of NOMOS or the Tangente before seeing them on Hans-Peter Brugger's TimeDesign.de website. What attracted me to the these watches were the wonderful dial designs. I liked the fact that they are simple handwinding watches with subseconds, seemed well-made and are relatively inexpensive. My favorite was the Tangente. In addition to the normal model, the Tangente is available in a limited edition of 2000 to commemorate Expo 2000, the World's Fair in Hanover. I picked the limited edition because it has blued hands and a display back (which the normal model does not) and is finished very differently from the normal Tangente the movement is engraved with a portion of the very complex and unusual Expo 2000 logo, which is a fractal pattern. (To the right is a photo of the NOMOS and Expo 2000 logos, foil stamped on the paper sleeve that encloses the Tangente's wooden box.) Although the collectability of a limited edition was not an factor in my choice, it is a nice "extra." I also like the idea of owning a German watch from the famous watchmaking city of Glashütte. 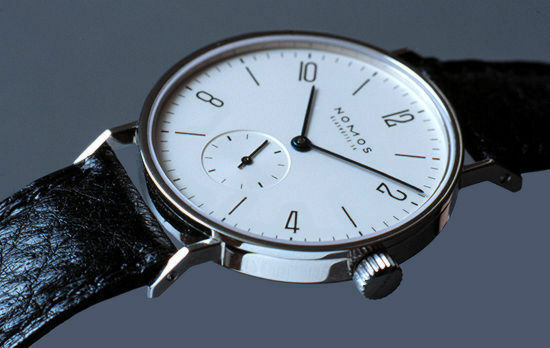 Hans-Peter is an authorized NOMOS dealer, and the transaction between Germany and the U.S.A. went very smoothly. Shortly after purchasing the watch, I received my copy of Wristwatches Annual 1999, and was pleased to see not only a listing for NOMOS and the Tangente, but also a Wempe ad featuring this watch. The German watch companies A. Lange & Söhne, Glashütte Original, Union Glashütte and NOMOS Glashütte SA are all neighbors, located on the same street Altenberger Strasse in the city of Glashütte, the heart of Germany's famous Saxony watchmaking region. Glashütte has been a center of German watchmaking since the 1840s. Glashütte was part of East Germany following World War II, and its industries were put under Soviet control. Some of the Glashütte factories were dismantled, and many skilled German workers were relocated elsewhere. In 1951, the eight surviving Glashütte watch companies were merged to form Glashütter Uhren-Betriebe (GUB), which was controlled by the East German government. 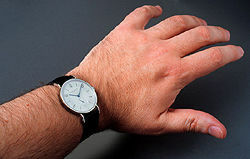 In 1967 the government combined all of East Germany's watch manufacturers together to form the giant Uhrenkombinant Ruhla. With the reunification of Germany, the Uhrenkombinant Ruhla was broken up and liquidated, and several former German watch companies were able to re-establish themselves in Glashütte, including A. Lange & Söhne, Glashütte Original and Union. NOMOS Glashütte SA, is a new watchmaking company founded by Roland Schwertner, and was the first company to produce watches in Glashütte after reunification. There are rumors that they are in the process of designing their own in-house movements. NOMOS comes from the Greek and means justice, law, order and describes the nature and function of the watch. The selection of the finest materials, exquisite workmanship and orientation towards functionality resulted in a NOMOS collection of timekeepers which manages to combine Glashütte watch-making tradition and a timeless design. From the middle of the 19th century onwards, Glashütte in Saxony became synonymous with high-quality German watches. Today, historical pieces from the then world-famous Glashütte watchmaking facilities are highly-valued collectors' items. Glashütte's fame faded in the wake of the Second World War and German post-war history. The merger of the two German republics into a single state made it possible to resume the German watchmaking tradition and to preserve and promote the location. 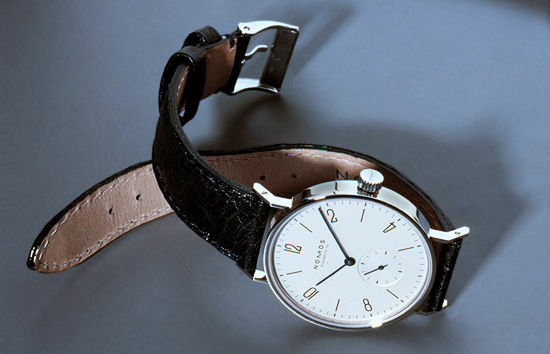 As the first quality mechanical watch bearing the Glashütte mark of origin on the market following German reunification, NOMOS was unable to manage without supplies of parts from Switzerland. NOMOS is currently in the process of expanding production in Glashütte to such an extent that the newly created employment opportunities will reduce the volume of supplies from Switzerland. According to Wristwatches Annual 1999, the NOMOS line was inspired by classic A. Lange & Söhne watches from the 1930s, and were designed by German graphic artist Suzy Günter. 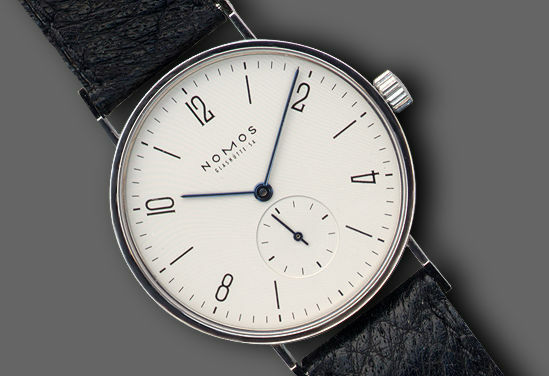 Her NOMOS designs follow the spirit of the German Manufacturer's Association, which formulated a set of Bauhaus-like design principles in the early 1900s. The entire watch has a simple, delicate and refined look, from the very straightforward dial with its thin hands, to the slim case and unusual, angled lugs. When I first took the watch out of its box, I was surprised to see how flat it is. The bezel is not angled or rounded, and the crystal is set flush into the bezel, so the whole front of the watch is perfectly flat. The sides of the case are vertical, so the overall shape is simply a thin disk with lugs attached. The dial is finely sandblasted and then silver plated. The dial does not look silver-colored, but is a matte, off-white color, like a very pale beige. You can only occasionally see the silver color at certain angles to the light. The very delicate markers and numbers are printed in black. The dial printing is very high-quality I cannot see any imperfections anywhere, even with a loupe. The seconds subdial is slightly sunk into the main dial. The dial takes up almost the entire front of the watch there is only a 1mm bezel around the outside. The watch looks much bigger than I expected from the dimensions, probably because of the large dial size. The dial is larger than the dial on my 39mm Ventura v-matic. The blued steel hands are very thin, and are very close to the dial surface the entire case is only 6mm thick. The hour and minute hands have sharp points. 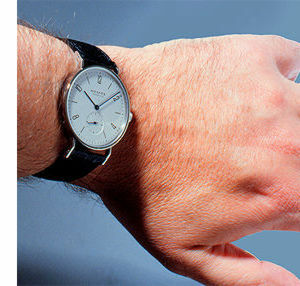 A larger dial means that the finely-printed minute markers are farther apart, and the very slim and pointed hands can be read and set with a high degree of precision. I love the dial and hands. The strap lugs are unusually shaped. They are long and quite thin from the front about 1mm thick and about 3mm deep. Although they appear delicate, the lugs and case are a single piece of steel, and are quite strong using reasonable force, I can't flex them at all. The lugs come straight out of the case, then kink diagonally downwards. The strap attachments are placed after the kink, so the strap attaches at a point almost level with the bottom of the case. These thin and long lugs contribute to the light and slim look of the watch. Instead of springbars, there are small screwheads visible in the sides of the lugs where the strap attaches, so there seems to be a rigid bar screwed between them. This may help reinforce the thin lugs. The crystal and display back are both sapphire. The crown is signed with a very finely engraved NOMOS logo. The crown is not screwed, so the watch has a 30-meter water resistance rating. The Expo 2000 limited edition has a display back, and the movement is specially finished with a fractal pattern based on the unusual Expo 2000 logo. The upper surfaces of the plates and bridges are finely sandblasted, then engraved with the center section of the logo. After engraving, the plates and bridges are silver plated. The fractal pattern is made out of little pixels, and even with the naked eye, you can see the little geometrical shapes cut into the surface. In the photos, the darker areas have been cut away; the lighter areas are the surface of the plates in places, quite large areas have been cut away. The edges of the plates and bridges are square, with no anglange. The crown wheel and ratchet wheel both have the "Glashütte solar" finish. The holes for the blued screws are not chamfered. Because the plates and bridges have a sandblasted finish, they are a dull, light gray color. The bright blue screws and red jewels stand out dramatically against the dull surface, as do the bright gold and steel parts only the plates have a dull finish. The disk at the center of the crown wheel is engraved with the NOMOS logo this is the only text engraved anywhere on the movement itself. This disk is fixed in place, so when winding the watch, the outer teeth turn but the disk and logo do not. Looking carefully at the movement through the display back, I have not spotted any scratches, burrs or signs of poor workmanship. 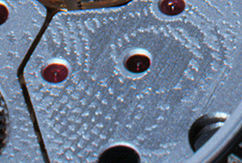 From what I can see, the workmanship on the movement was very neatly done. I've been pleased with the performance of this watch. Either when being worn or sitting face up, it runs -1 or -2 seconds per day. I have not done any timing tests on it, but the literature claims that it's adjusted for 4 positions. It has been very consistent over the two months I've had it. Out of the box, the strap was initially very stiff, but once it started to break-in, the Tangente sat very well on my wrist. 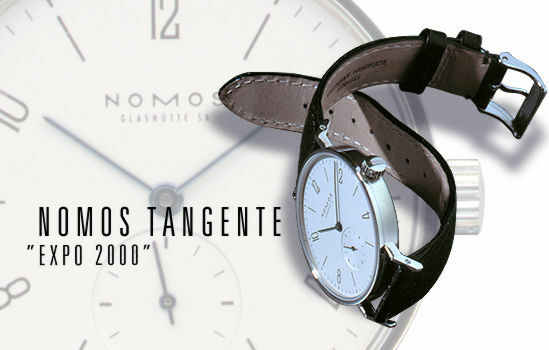 The Tangente Expo 2000 comes with an thin, textured black leather strap, with a steel buckle. The strap has a semi-gloss finish, and the brightly-polished steel buckle is engraved with a copyright notice for Expo 2000. The thin strap suits the very slim watch case. I have about a 7.5-inch (19cm) wrist, and the Tangente fits me comfortably. Because the watch is so flat, and has such long lugs, if my wrist was smaller, I might have a fit problem. Even though the lugs bend downwards, the strap attaches at about the level of the bottom edge of the case, so the whole 44mm length, from strap attachment to strap attachment, is flat. The top surface of my wrist is just wide enough to accommodate this. If the lugs angled down a bit before they kinked, the watch would match the curve of the wrist better. The long lugs emphasize the slim, flat shape of the case. This watch looks very good on the wrist. The large dial is easy to read, even in dim light. Although it's silver plated, the dial is not shiny or glossy, and the contrast between the dial and the hands and numbers is always very good. The Tangente is slim and delicate enough to be worn as a dress watch, but because of its bold design, would not look out-of-place when worn with casual clothes. The Tangente comes in a black-stained basswood box. The box has a push-button latch and the NOMOS logo stamped in metallic silver on the top. The inside of the box is lined with padded black velvet, and the lid has a small strap sewn to the padding to hold the small booklet and warranty card. 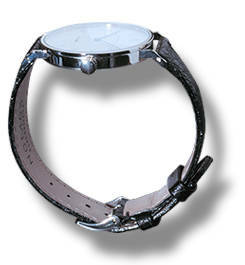 The watch is held flat by two small loops that hold the ends of the strap. 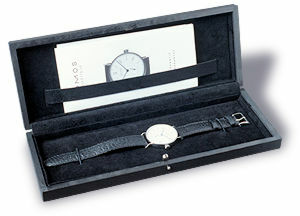 The box comes in a black, heavy paper sleeve with the NOMOS and Expo 2000 logos stamped in silver on the top. 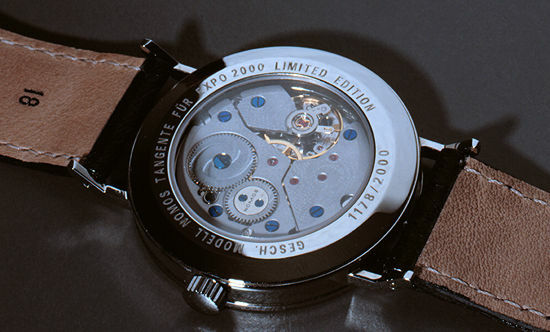 The regular Tangente model does not have a display back, and has black instead of blued hands. 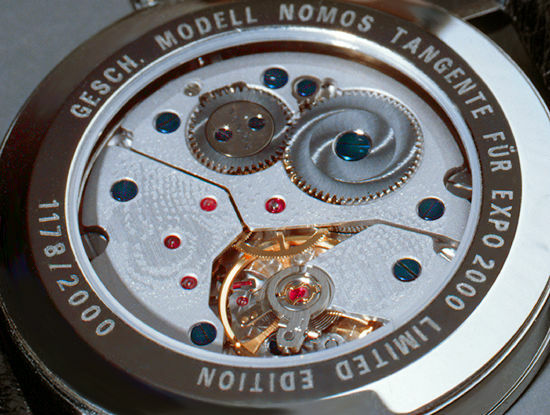 The movement, although not visible, is finished with the more traditional Côtes de Genève on the plates and bridges, and the plates are rhodium plated. There are two alternative versions which look more different from the Expo 2000 edition one has a silver chapter ring around the outside of the dial, and a silver subdial for seconds, the other has a solid gold case, and has a gold chapter ring and subdial. I prefer the plain dial to the fancier dials. In choosing the Expo 2000 edition, one thing that I wrestled with was the fact that the limited watch has blue hands and the regular model has black hands. I thought that black hands might fit the simple look of the dial better than blue ones. However, I'm happy with my choice. Other models include the Ludwig, whose dial is very similar to the Tangente's, but with Roman Numerals substituted for Arabic numbers. The case has different lugs and a different crown. It is available in gold, or in a steel case with or without a display back. This steel version is the only model other than the Expo 2000 that is available with a display back. The Orion is available with a silver-plated or black dial, and has applied stick markers in place of numbers. The black dial has gold hands and markers, the silver dial has blued hands and markers. This case also has different lugs, and is also available in gold. The Tetra has a similar dial to the Tangente, but has a square case. The options are similar to those for the Tangente you have your choice of the plain dial, steel with silver chapter ring and subdial, or gold case with gold chapter ring and subdial. I am quite happy with the Tangente. I am attracted to watch designs that are straightforward and unpretentious. I dislike watches that are flashy, or designs that compromise function for style. The Tangente's design is simple and functional, yet elegant. The tall Arabic numbers, very slim hands, tiny bezel and thin case all combine to make a very beautiful overall design. The watch looks both modern and classic at the same time. It is light and comfortable to wear. Hans-Peter sells the Expo 2000 for 550 EUR/$607 U.S. on his website. The normal Tangente is about $100 cheaper. At this price, I think it is a great bargain. This is a very distinctive watch that I enjoy wearing.